↑ "Indian hockey's famous legend Dhyan Chand's resume". Mid Day. 3 December 2015. Archived from the original on 1 April 2016. https://web.archive.org/web/20160401094009/http://www.mid-day.com/articles/indian-hockeys-famous-legend-dhyan-chands-resume/15527174. अन्तिम पहुँच तिथि: 1 April 2016. ↑ Dharma Raja, M.K.. "HOCKEY WIZARD DHYAN CHAND. REMEMBERED". Press Information Bureau (Government of India). Archived from the original on 1 April 2016. https://web.archive.org/web/20160401090715/http://pib.nic.in/feature/feyr2000/faug2000/f220820002.html. अन्तिम पहुँच तिथि: 1 April 2016. ↑ "भारत रत्न के लिए भेजा गया था मेजर ध्यानचंद का नाम". पत्रिका समाचार समूह. 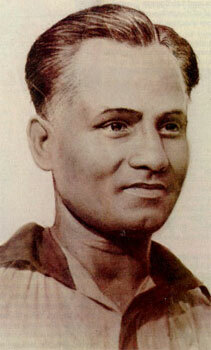 ३० जुलाई २०१४. http://www.patrika.com/news/upa-government-made-last-minute-change-to-ignore-dhyan-chand-for-bharat-ratna/1020773. अन्तिम पहुँच तिथि: ३० जुलाई २०१४.